Spiral crochet is quite easy and when worked with more than one color has really fun results. It is the same as working continuous rounds. When you use more than one color of yarn, then you’ll start with them from the very beginning of the spiral. There are a few extra steps when working with more than one color, but they don’t make it more difficult. So, don’t let that deter you. Spirals can be used in many different kinds of projects from pillows and blankets to purses and hats. 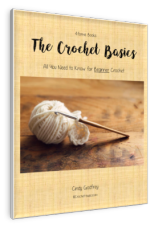 They are also used often in Freeform Crochet. 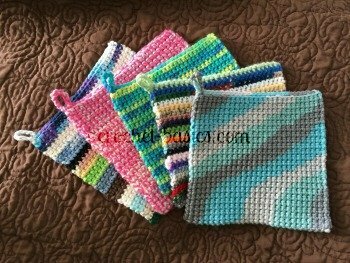 Any kind of stitch can be used in these rounds, but single crochet and double crochet are used the most. This helps keep the stitches close together so that the colors of the spiral can easily been seen. Here’s a walk-through of this technique. Let’s create our own motif. This motif will have 2 colors. You can use this same technique to add more colors if that’s what you want to do. They are added at the beginning in the same way we will use. In continuous rounds, you usually keep track of your rounds by using a stitch marker. For our motif we won’t need to use a stitch maker, though. Start with a magic ring in Color A. Work (sc, hdc, 2 dc) into ring. Pull your loop, making it bigger and remove the hook. Attach Color B in the ring. Pull the magic ring until it is closed tightly. Work 2 dc into the 1st sc of Color A. Work 2 dc in each of the next 3 stitches. Be sure to keep the loop of the color you are not working out of your way so that it won’t get tangled in your stitches. Pull the loop bigger and insert your hook into the Color A loop. Work 2 dc into the 1st stitch of Color B. Continue to work 2dc into each stitch of Color B. Pull the loop bigger and insert your hook into the Color B loop. Work 2 dc into the double crochet of Color A. Continue to work 2dc into each stitch of Color A.
Repeat * to * to the end of color B.
Repeat * to * 4 times. 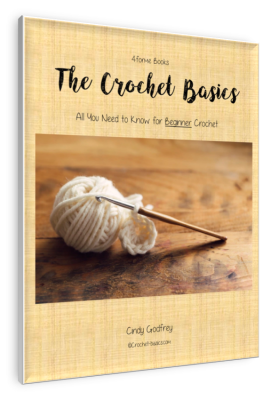 Now, there are 2 ways you can finish off your spiral crochet, stepped end or a tapered end. A stepped end is when you fasten off after you finished your last dc. It will leave your end with a step, which explains the name. So, if this is the end you want, simply fasten off after your last dc of each color and weave in your ends. A tapered end gives you a gradual finish to your piece, keeping a more rounded look. This will also make your end much less obvious. To do this you need to work a series of stitches that are decreasing in size into the next 3 or 4 stitches of the previous round. *Work 1 hdc into the next stitch. Work 1 sc into the next stitch. Ss into the next stitch. Insert hook into loop of Color B. That's all there is to it. You can make it smaller by stopping the rounds sooner or make it a little bigger by continuing the rounds in the same way. Remember more than 2 colors can be worked into your spiral crochet using the same method as above. Experiment with your colors and see what fun motifs you can come up with.